The western and northwestern suburbs bore the brunt of the storm, with Blacktown particularly hard hit with tiles off roofs and trees brought down. Weatherzone reported 4649 lightning strikes between 3am and 6am, and the SES received at least 150 requests for help. The weather bureau says lightning strikes will continue over the Sydney region and most parts of NSW on Tuesday. Passengers can expect slight delays on domestic flights out of Sydney Airport, but international and domestic arrivals are on time, an airport spokesman said. Meanwhile, rail commuters on Sydney's north shore T1 line can expect delays. 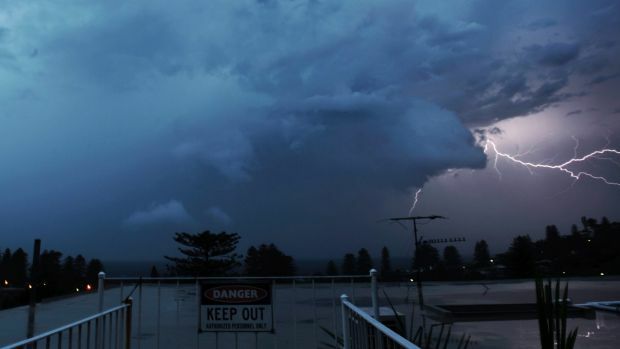 "It's quite an active lightning system over Sydney," BOM forecaster Jordan Notara said. He said the lightning will die down this morning before building up again in the afternoon. "It's a typical summer scenario," he said. The SES has warned NSW residents to take precautions as the storm activity continues. Residents are warned to secure outdoor furniture, tie-down trampolines and stay inside and keep away from windows.